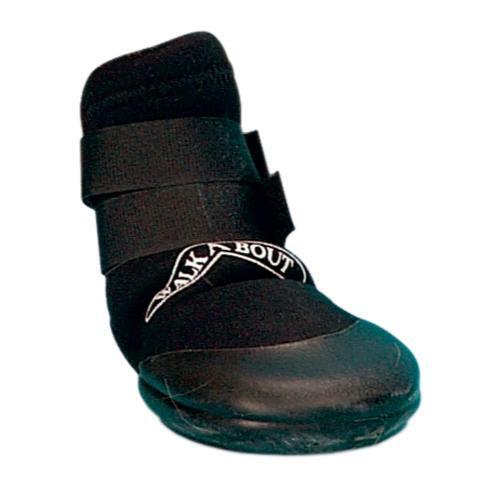 The Buster Walka Boots are specially designed dog boots to help your dog recover from injury. Whether you dog has an injured or bandaged paw, Buster Walka Boots provide superb comfort and ease of movement whilst enhancing the protection of the wound. Made from durable Neoprene, Buster Walka Boots are both water and heat resistant. With a padded rubber sole, Buster Walka Boots also offer superb grip, support and insulation to further enhance healing. Available in three different sizes, Buster Walka Boots are perfectly suited to your dog and, due to the quality Velcro fastening system, are always well fitted. Boots are sold in singles. The following sizes are the size of the sole of the boot. Below are some recent questions we've received regarding Buster Dog Walka Boots, including answers from our team. Do you get 4 boots or just 1? The boots are sold in singles.